Outdoor cooling systems are wonderful if you plan on spending time outside this summer. There is no need to stay inside to stay cool if you have a patio misting system. Mist cooling systems can drop outside temperatures by up to 20 degrees Fahrenheit, making a horribly hot day much more manageable. There are many reasons for installing a mist system on your patio, deck or porch. 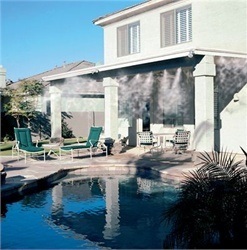 If you plan to have summer barbecues, pool parties or family reunions, a misting system is just what you need. There are a few steps to take when determining what you need for your outdoor misting system. You may choose to use a mist system kit where many of the parts are provided for you in an all-inclusive set. You may want to design your own from scratch too. Either way, there are few things you need to know before purchase mist system parts. First, you need to determine how much mist line or mist tubing is needed. To do this, simply measure all open areas on your deck or patio or wherever you plan to install your misting system. This could be on a playground set, gazebo or any other outdoor area. Second, from your measurements, you must determine how many misting nozzles are needed. Generally, mist system nozzles are spaced every two feet. If you have 20 feet of area to mist cool, you will need 10 mist nozzles. Third, determine how much supply tubing you need. mist system supply line runs from a garden hose faucet to the first nozzle in your outdoor misting system. The first misting system nozzle should be placed at least 2 feet from from your hose or porch cover. Once you have this information, you can make a sound purchase. You may also want to purchase a high pressure mist pump if you are want to mist larger or multiple areas from one water source. You might also consider getting a hose faucet timer to automate misting just in case you happen to forget to turn the misting system off after being outside. Enjoy a hot summer much more with an outdoor mist cooling system. They are easy to install and great for neighborhood and family gatherings as well as lounging outside.